April 19th from 5-7pm – Member Social @ American Fish Co. The first Fishing Club meeting of the season will be held on April 7th from 2-4pm at Filet’s Restaurant (on the deck) at Harbourgate Marina. Speakers include: Capt. Keith Logan, The U.S. Power Squadron, West Marine & Seacoast Anglers (Hook a Kid on Fishing). This will be a very informative meeting and West Marine has lots of free goodies for us! Following the meeting we will put some appetizers out for guests to share. We encourage you to stick around for dinner and/or drinks afterwards to show our appreciate to Filet’s for letting us use their deck. Please RSVP by calling 843-732-4711 or simply reply to this email with the number of people attending. The fishing trip for April will be held on the 28th. For more information or to RSVP, please email Stew at fbcfishingclub@gmail.com. You can also let him know if you want to be added to the Fishing Club email list. Please join the Freedom Boating Divas of Charleston on April 8th from 10:30am-2pm for a ride around the Charleston Harbor and lunch at California Dreaming. You will need to provide your own transportation to Charleston. Freedom Boat Club will provide water, soft drinks and wine for the boat ride there and back as well as appetizers for the group to share at the restaurant. Members and guests will be responsible for their lunch and drinks at the restaurant. Members will be billed for their share of fuel. Guests are welcome to join us for a charge of $10 that will be collected at lunch, cash only please. The $10 charge for guests will cover their share of appetizers and fuel. We will depart from the Wacca Wache Marina in Murrells Inlet at 10:00am and head to Georgetown for lunch at the Big Tuna and return around 4pm. We will practice our navigation skills using charts. You’re invited to join us for Captain Poo’s Swing Bridge Dedication Party on April 14, from 1-4pm at the Harbourgate Marina in North Myrtle Beach. At 2pm the Little River Swing Bridge will be officially renamed the Capt. Poos’ Swing Bridge. There will be a dedication celebration along with a boat Regatta at the Harbourgate Marina. Wanna be one of the first people to go through the bridge? We do! RSVP by calling 843-732-4711 if you’d like to ride along… or feel free to reserve a boat and go with your group. We will load up the boats around 1:15pm and go through the bridge around 2pm. Following the dedication Freedom Boat Club will provide hot dogs and all the fixins, so stick around and have some fun, just look for the Freedom Boat Club tent. The first member boat trip of the year was originally scheduled for April 3rd but we have decided to move it to April 17th. We are hoping Mother Nature will warm things up a bit for us by then. This also happens to be on Karen’s birthday and she wants a boat ride for her birthday so a boat ride she shall get! We will be departing the docks from Southport Marina at 10:30am and from the Harbourgate Marina in North Myrtle Beach at 10:00am. We will have lunch and return around 4-4:30pm. 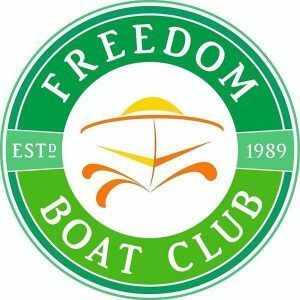 Freedom Boat Club will provide beer, water and soft drinks for the boat ride there and back. Guests are welcome to join us for a $10 charge per person, to be collected at lunch, cash only please. This will cover their share of appetizers and fuel. Members will be billed for their share of fuel. Members and guests will be responsible for their own lunch and drinks at the restaurant. RSVP is required by calling 843-732-4711. Space is limited and it’s on a first come, first served basis. Our first Member Social for April will be held on April 19th from 5-7pm at the American Fish Company located in Southport. Freedom Boat Club will provide appetizers for the group to share. Members and guests are responsible for their drinks. Please RSVP to DAVE by calling 910-612-0969 with the number of people attending. Our second Member Social for April will be April 26th from 5-7pm at the Crazy Sister Marina located in Murrells Inlet. Freedom Boat Club will provide snacks and drinks for your enjoyment. Look for the Freedom Boat Club tent by the Wicked Tuna. Please RSVP to KAREN by calling 843-732-4711 with the number of people attending. We have relocated Karen’s office back to the Harbourgate Marina in suite 2203 (upstairs) and we are ready to celebrate with a member social. Please note, we still have our FBC Headquarters location on Hwy 9, Little River, SC. Freedom Boat Club will provide beer, wine and soft drinks as well as appetizers for your enjoyment. Please RVSP by calling 843-732-4711 or simply respond to this email with the number of people attending. We need your RSVP so we can assure that we have enough food and drinks for everyone. Feel free to bring guests. 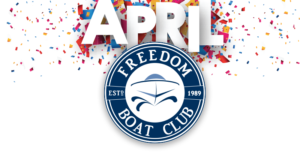 Please note: There will be an Open House / Member Social taking place on March 17th & March 31st at the Freedom Boat Club located at the Southport Marina, please RSVP to Dave Patterson by calling 910-612-0969 for the Southport Open House/Member Socials. Appetizers as well as beer, wine and soft drinks will be provided by FBC. The Freedom Boating Divas Program is designed to empower women boaters. Join us for a Diva Lunch and Learn on March 15th from 10:30am-2pm. We will depart from the Harbourgate Marina in North Myrtle Beach and cruise around the area a bit and then end up at Snooky’s on the Water. This month we will practice our backing, turning and trimming skills. 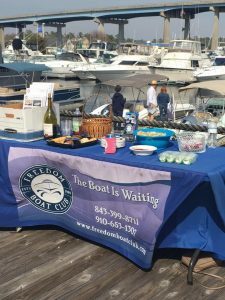 Freedom Boat Club will provide wine, water and soft drinks for the boat ride there and back, as well as appetizers for the group to share at the restaurant. The Divas will be responsible for their own lunches and a share of the fuel. Guests are welcome but are required to pay a $10 cash fee to cover their share of appetizers and fuel, to be collected at lunch. Please RVSP by calling 843-732-4711 or simply respond to this email with the number of people attending. There will be a Diva outing out of our Mt. Pleasant location on April 8th, please let me know if you are interested in attending from 10:30am-2:00pm. Come and ride or walk with us in the biggest parade on the Grand Strand, dogs welcome, too. Show your Freedom Boat Club Pride and have some fun as we sport our green together. We’ll have a prize for the best dressed and most enthusiastic member. Joanie Skinner was our winner last year, congratulations Joanie. The parade starts at 9am and you would need to be there by no later than 8:30am. More details about parking and our lineup number coming soon. ​So you say you want a Free T-shirt for participating? No problem! What size do you need? This is one of our favorite events of the year to participate in because to us it means that Boating Season is finally almost here. Who’s ready? Hello spring! Good bye crusty old winter socks. Join us at the Freedom Boat Club located at Habourgate Marina or the Southport Marina on Tuesday, Mach 20th from 5 pm to 7 pm for our “Burning of the Socks” celebration. Please RSVP by calling 843-732-4711 or simply respond to this email with the number of people attending along with the location. You haven’t been on your boat since last boating season. Tension is mounting and you have little energy within you. You are eating more to relieve stress. One effective way to lower these blahs, according to psychologists, is to relax. But the very best way to re-energize and increase your optimism is to burn your winter socks. 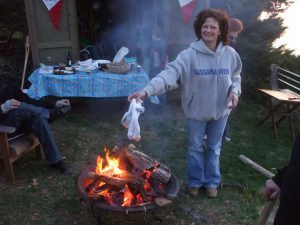 Yes, you can both eat more and relax by burning your winter socks at the Freedom Boat Club’s “Burning of the Socks” celebration on March 15th scheduled on the Vernal Equinox. So what’s the “Burning of the Socks” all about? It’s become a coastal tradition, dating back to the early 1980s, starting in Annapolis. There, Bob Turner, who managed a boatyard, got tired of the winter blahs. While working on other people’s boats all winter, his socks collected sawdust, bottom paint, caulk, fiberglass resin, and other boat yard leavings. In other words, his socks would stand up when he took them off at night. One year, on the first day of Spring, he took off his socks, put them in a paint tray, sprinkled on some lighter fluid, lit them, and had a beer to celebrate. And so the tradition began. There are now sock burnings in boating towns across the country. North Carolina has the 2nd largest state-maintained highway system with nearly 15,000 miles of primary highways (Interstates, US and NC Routes) and almost 65,000 miles of secondary roads. The cost for NCDOT to keep these roads litter-free tops $16 million annually. To help offset these costs the NCDOT and AAHLRSA offers a 1-mile segments for sponsorship through the Sponsor-A-Highway Program. Freedom Boat Club has adopted a portion of Highway 210 leading into Southport. This will be our area to keep clean for the next 4 years and we need your help. Please join us on March 24th, we’ll provide everything you need to help us keep Highway 210 beautiful and trash free!